This month I’m going to discuss a job that I performed recently involving the installation of Koolmat temperature insulation. 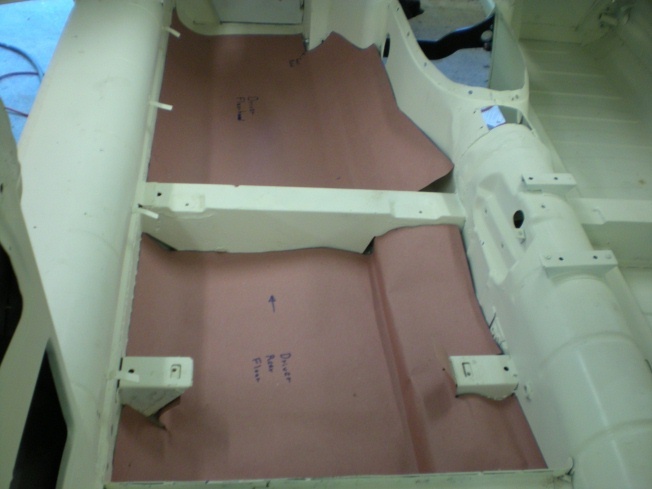 There are various products that you can install between the sheetmetal of the car and the carpets. All of these products satisfy several requirements, some better then others. One requirement is to reduce the transfer of heat from the engine compartment into the passenger compartment. Another requirement is to reduce the transfer of noise. Another requirement is to provide a cushy base for the carpet. Yet another requirement is to keep moisture brought into the floor boards by wet shoes from being trapped and causing mildew or rust. Finally, Jaguar was very likely concerned about cost and ease of application in an assembly line environment. 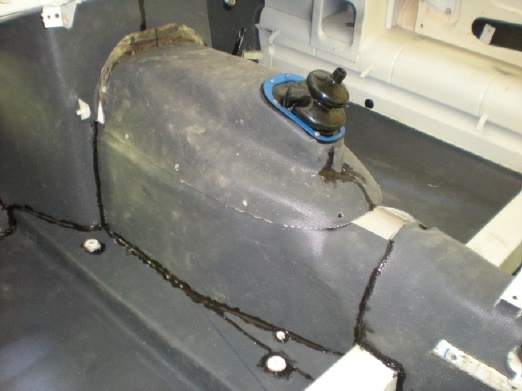 Based on what I observed during disassembly of the car, Jaguar originally sprayed the floor and transmission tunnel with a tar based material. On top of this a carpet padding made of a coarse hair like material was used. The carpet laid on top of these materials. These materials probably met the last two requirements best! Modern versions of tar based materials are still available. 3M and others sell a brush on tar like material advertised as a sound deadener. There are several modern products that are designed to reduce the transfer of noise from outside the car. Some of these also tend to dampen noise generated inside the car from music systems. Frankly, I don’t think that the interior of an E-Type is ever going to be a concert hall environment where I will want to listen to soft passages from my favorite classical CD as I cruise down the highway! But as I have already learned with my other car, heat from the engine is definitely an issue with this non air-conditioned and poorly insulated car. So I leaned toward a product with superior heat insulative properties. Although I am not sure, I would bet that Koolmat was developed for aerospace applications. It provides a lot of insulating capability in a very compact package. 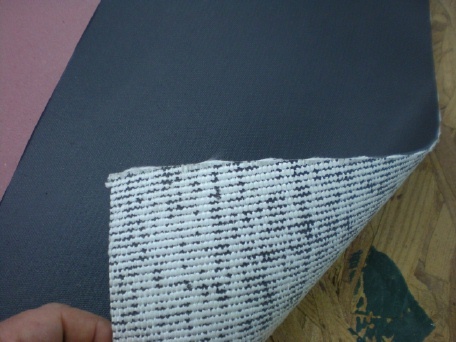 The material basically consists of a thin layer of grey silicone with a substrate of fiberglass cloth adhered to the back side. The resulting composite material is only about 1/16″ thick. To jump ahead in my story a little bit, I was interested in some sort of test for this material. What I did was this. Before I got started, I set up a 150 watt lamp pointed directly at the passenger side footwell from the outside. With my infrared thermometer, I checked the initial temperature on the inside of the car, which was about 70. I then turned on the lamp. After 1 hour had gone by, I measured the temperature again on the inside of the car and found it to be 120. I repeated this experiment after the Koolmat install. With the Koomat installed, the temperature inside of the car was only 100. So there was a 20 drop in temperature after the installation of the Koolmat. Not bad! The Koolmat literature also touts its sound insulating properties but I couldn’t think of an easy way to test that. Koolmat’s representative in Mooresville, NC has existing patterns for a Series 1 FHC or OTS. But they didn’t have any patterns for my 2+2. So my first step was to make patterns. I started using newspaper but soon switched to some heavy paper I bought at Home Depot, which may be known as rosin paper. It is redish in color and comes in 36″ wide rolls. 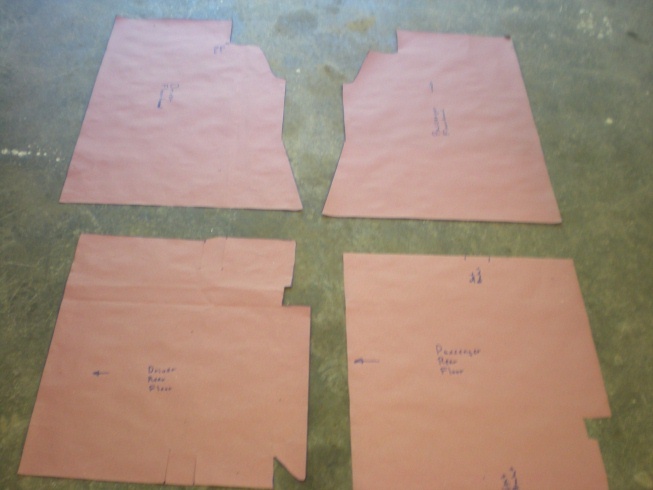 The Koolmat material is only 30″ wide and this needs to be considered when making patterns and laying them out. I made up a set of patterns for the floorboards, the footwells, the transmission tunnel, and the removable transmission cover. The Koolmat will easily curve and fold in one direction. To a small degree, it can be molded over compound curves but if much bending in 2 directions is required, you have to add slits. The joints between pieces don’t have to be “furniture grade” as you will fill in the gaps will silicone caulk later and of course everything will be covered by the carpet or other upholstery. Generally speaking, the patterns for the driver’s side and the passenger’s side are mirror images of each other. Once the paper patterns are made, you can do a layout to see how many linear feet of 30″ wide Koolmat material you will need to order. I wound up ordering 15 linear feet for the 2+2, which left just a small amount of extra. 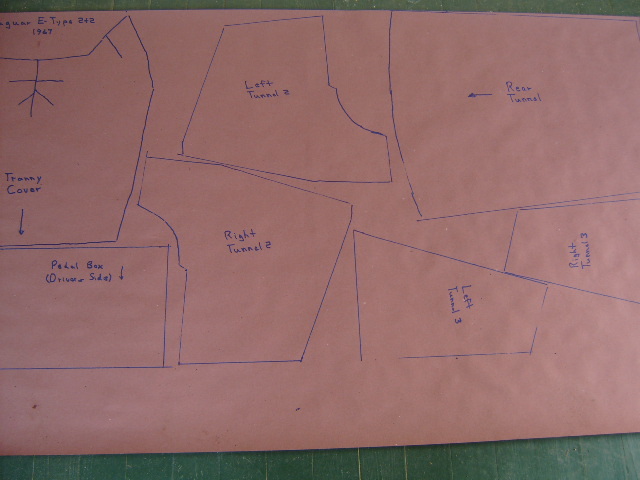 When you get your material, lay it out on a flat surface and apply your patterns. Note that the white fiberglass side goes down. I traced around my patterns with a marker. Then I could remove the pattern. 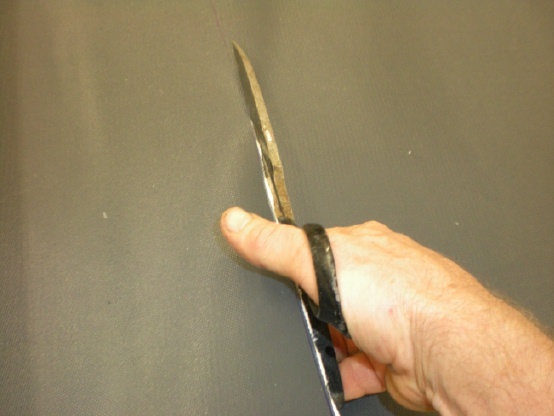 The Koolmat cuts easily with heavy scissors. It will also cut with a utility knife, although you will need a scrap piece of plywood to cut against. After you cut out each piece, you will want to test fit it in the car. You may want to be conservative and cut each piece a little oversize, although the ability to fill any gaps with silicone caulk gave me courage to go straight to the final size based on the pattern. You will find that you have to cut around various items, such as seat mounting brackets and what not. Once you have a few pieces ready, its time to glue them in. 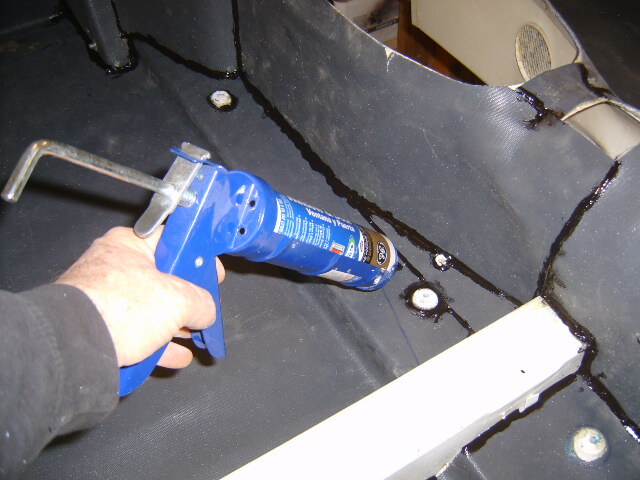 Do be aware that the raw Koolmat has a rather distinct smell as it comes off the roll and once you get started with the adhesives the odors become very intense so if at all possible do this job in a well ventilated area. If you are in the vicinity of any gas appliances with pilot lights, these need to be shut off, per the instructions on the can of contact cement. Note that a week after the installation, after everything cured, all the odors were gone. 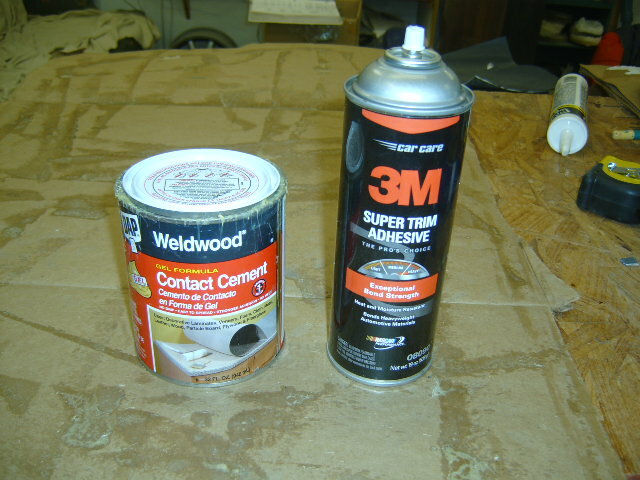 Koolmat recommends an aerosol contact cement produced by 3M that is for heavy duty applications (3M # 8090). The advantage of this product is that it can be sprayed on and the wait time between spraying and installing is only about 5 minutes. The main disadvantage is that it is $20 a can and it would probably take 4 to 5 cans to do the job. I bought 2 and ran out. I defaulted to the more traditional contact cement sold at Home Depot which comes as a gel, is applied with a brush, and has a wait time of 20 minutes before assembly of the pieces. It’s only $8 a can and 2 to 3 cans would do the job. It’s your choice as both will do the job. For both products, you need to get the position of the pieces correct on the first try, since as the name implies, they do grip “on contact”. Oh, also, the gel product requires that a pressure be applied over the surface after assembly of the parts. I used a small roller that is sold for wallpaper work. As you may see in the pictures, free edges can benefit from the application of clamps, although this is not mandatory. Once I was done glueing down the pieces, I came back with a tube of silicone caulk and filled in all the seams and joints. According to the Koolmat literature, this is key to providing a good seal against heat transfer. Another advantage of this step and of the Koolmat in general is that any moisture that works its way through the carpet and pad is not going to reside next to that valuable floorboard sheetmetal but instead is going to pool on top of the waterproof silicone surface. All in all, I am very pleased with the look of the interior now that the Koolmat is installed. The installation process was not too difficult to undertake. And I am very excited to know that I will have a cooler, quieter interior to enjoy my Jaguar motoring within. Wow, good job with installing that, it’s looking great! Have you had the chance to test it out yet? I’d be really interested so know how good the sound deadener properties are of that koolmat. I’ve been looking around and wanted to know how you’ve like this one. Koolmat is optomized to be a heat insulation. It is only average from a sound insulation standpoint. 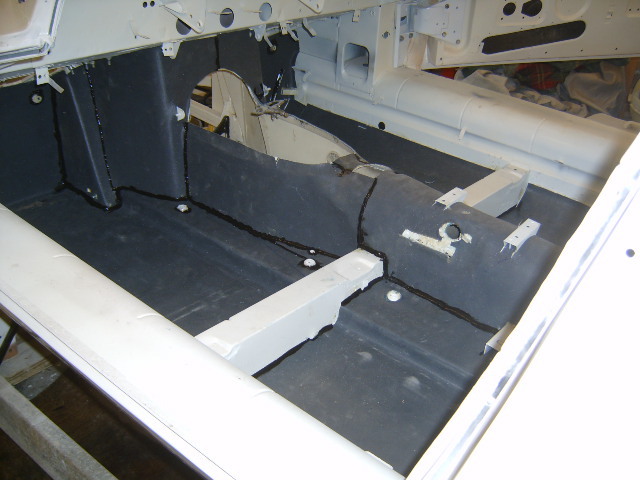 I will say that Koolmat covered with carpet pad and carpet caused my E-type to get much quieter.